It’s enough to make one homesick. 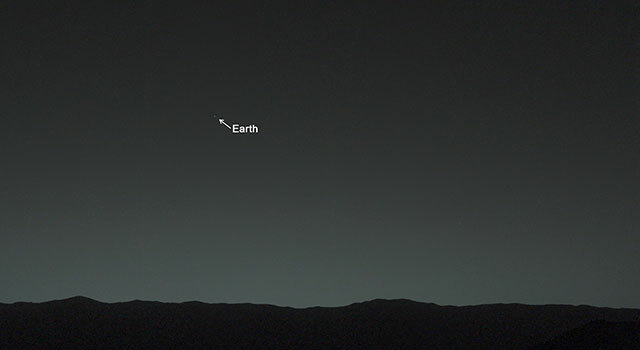 This view of Earth from Mars. Taken by the Mars rover Curiosity 80 minutes after sunset during the rover’s 529th Martian day (Jan. 31, 2014). 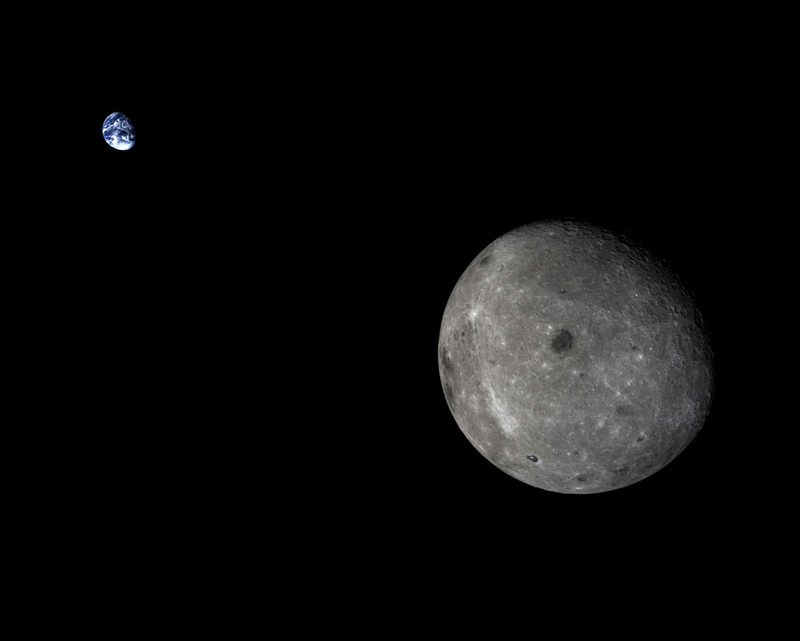 This image includes the moon and this is obvious in the zoomed in view (right). 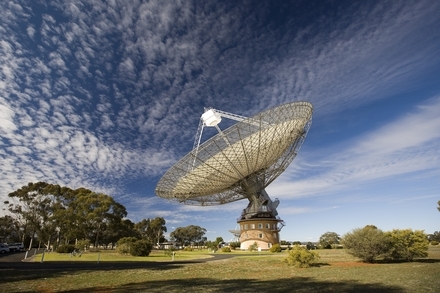 Thanks to Jet Propulsion Laboratory | News. Photography can produce some great abstract art. Even if it’s of the very large or very small. Here’s some really beautiful abstract art based on photograph of earth taken from orbit. The Dasht-e Kavir, or Great Salt Desert, is the larger of Iran’s two major deserts, which occupy most of the country’s central plateau. In 1960, the United States put its first Earth-observing environmental satellite into orbit around the planet. Over the decades, these satellites have provided invaluable information, and the vantage point of space has provided new perspectives on Earth. This book celebrates Earth’s aesthetic beauty in the patterns, shapes, colors, and textures of the land, oceans, ice, and atmosphere. The book features 75 stunning images of Earth from the Terra, Landsat 5, Landsat 7, EO-1, and Aqua satellites. 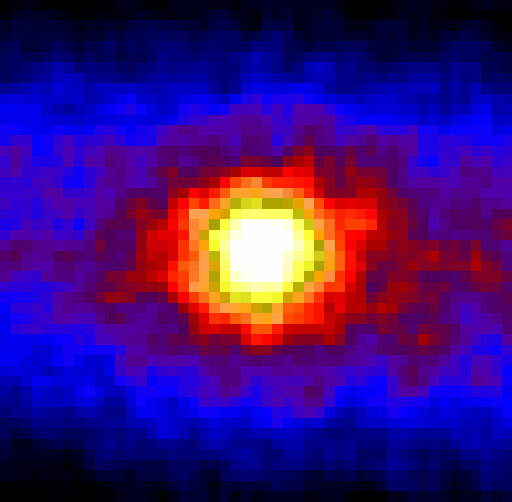 Sensors on these satellites can measure light outside of the visible range, so the images show more than what is visible to the naked eye. The images are intended for viewing enjoyment rather than scientific interpretation. The beauty of Earth is clear, and the artistry ranges from the surreal to the sublime. Earth as art—enjoy the gallery. via NASA – “Earth As Art”. Some of the people on teams managing the rovers on Mars call themselves “Rover drivers” or “Mars drivers.” Of course, things are not that simple. It is not possible to drive a vehicle on Mars in real-time from Earth. Instead, computer code must be uploaded to enable the vehicle to carry out planned manoeuvres, analyses, etc., autonomously. And the computer code can only be written after the results of the previous commands are known. In practice, this involves large teams of engineers, software experts and scientists. Each team has their own work – and the teams need to interact to plan the rover’s work, iron out priorities, and deal with problems. This work has to occur at strange times, and with deadlines, to fit in with the activity and day/night programme on Mars. Energy limitations means that the rover usually does not operate during the Martial day. So all this work, the meetings of each team and their joint meetings, and decisions about planned activity must take place before the rover “wakes up.” And because the results from the previous day’s activities feed into this detailed decision cannot be made and code written until after that data has been downloaded and analysed. The graphic above was shown in one of the recent Mars Science Laboratory – Curiosity – media briefings. 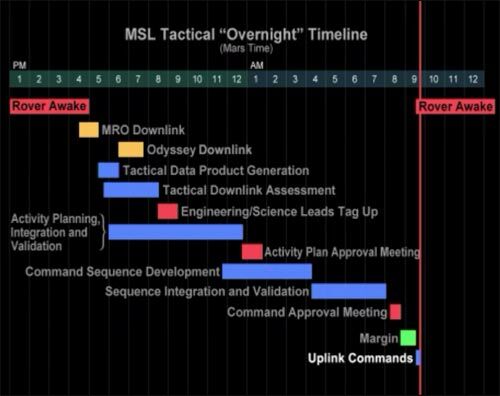 It indicates the time line for the Laboratory to be active (“awake”), the downloading of data via the Mars Odyssey and Mars Reconnaissance orbiters, assessment of data, planning of future activity (particularly that for the next day), interaction of engineering, scientific and software teams, integration of plans, validation and approval and then the sending of the new commands to Curiosity as it “wakes up” for the new day. I note they have even left a brief time gap “margin” to handle unforeseen problems. It must be fascinating to work in large teams like this on scientific projects. And I am sure there are also political and emotional problems that need management as well as the engineering, scientific and software problems. Apparently with groups managing Mars rovers the shift-work, and the drift in shift times because of mismatch in the length of the Earth day and the Mars sol, causes “jet lag.” So the emotional and human issues resulting from this also need management. Andrew Kessler gives an idea of the procedures involved in managing Mars rovers and landers in his book Martian Summer: Robot Arms, Cowboy Spacemen, and My 90 Days with the Phoenix Mars Mission . 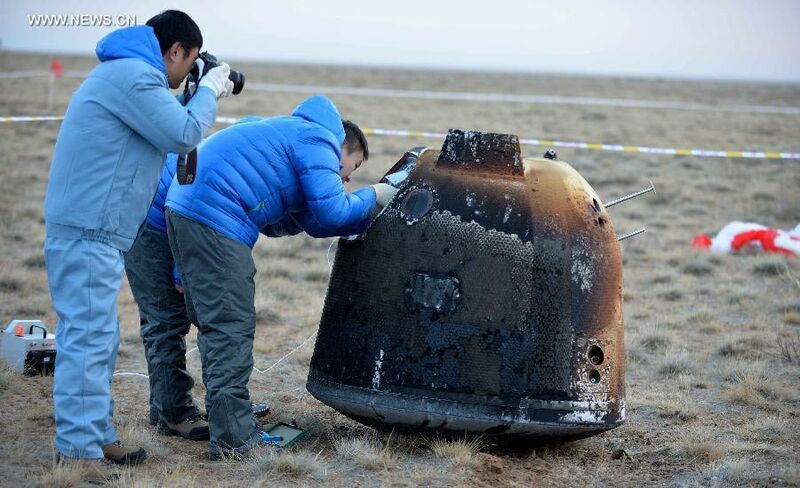 This is based on his own experiences as a journalist embedded in the teams managing the recent Phoenix lander. It’s a bit of an eye-opener – at least for someone who hasn’t worked in such large scientific teams before. See Working on Mars for my review of that book. Bloody hell, there are three times as many people on the planet today as there were when I was born! No wonder I find the cities and traffic too busy. Got the data from A BBC News web page – 7 billion people and you: What’s your number?. ” in the overall scheme of things, it isn’t that important. “The attention we received was 100% positive, but how different that could have been. “Imagine for a minute that, instead of discovering a diamond planet, we’d made a breakthrough in global temperature projections. People on the fringe of science would be quoted as opponents of our work, arguing that it was nothing more than a theory yet to be conclusively proven. There would be doubt cast on the interpretation of our data and conjecture about whether we were “buddies” with the journal referees. If our opponents dug really deep they might even find that I’d once written a paper on a similar topic that had to be retracted. It’s worth those of us outside the climate science community reflecting on this. Scientists and non-scientists alike. Consider the continuing harassment of Dr Michael Mann who is still be pursued by climate deniers and conservative politicians. What do they want. His emails from years back! (see Professor turns to law to protect climate-change work). This is a time exposure taken from the International Space Station (ISS). 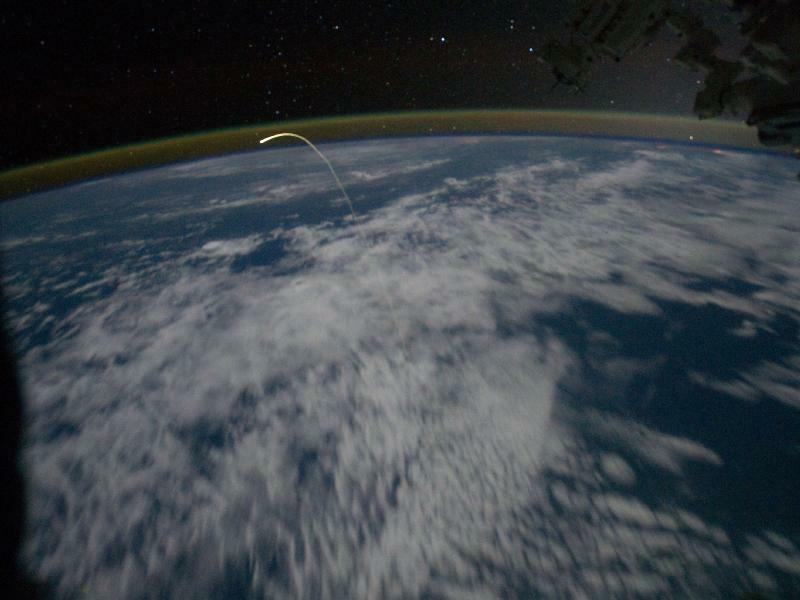 It shows the plasma trail of Atlantis as it travelled through the atmosphere on its final return from orbit. Thanks to NASA – Station Crew Views Shuttle Landing. While the Shuttle launches and the International Space Station get the media attention I am always impressed by the deep space research that is quietly going on. This weekend NASA’s Dawn spacecraft will (hopefully) go into orbit around the asteroid Vesta. 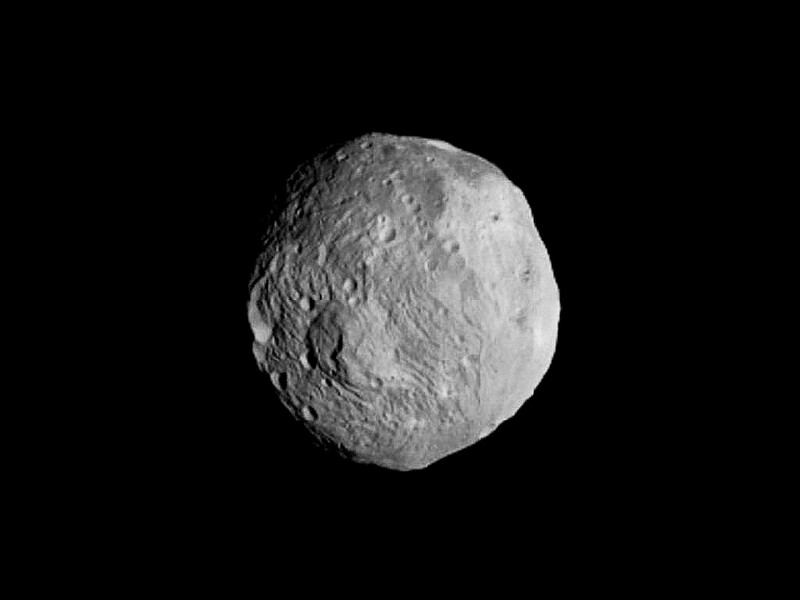 This photo of Vesta was taken by the spacecraft last weekend. With a diameter of about 500 km Vesta is the second largest asteroid in the solar system. Dawn will spend one year orbiting Vesta and will then travel to the largest asteroid (1000 km diameter) Ceres. There it will spend 5 months in orbit carrying out similar studies. Because these asteroids may have remained intact since formation of the solar system they should reveal information dating back to that time. They also have differences (Vesta formed a few million years before Ceres) which will also be illuminating. 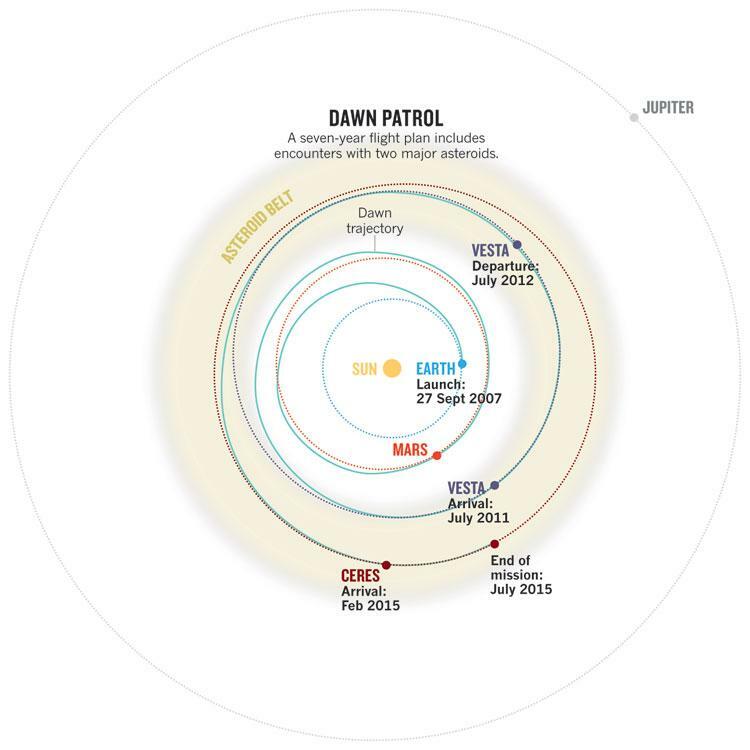 This diagram shows the trajectory of Dawn’s trip, together with dates. Dawn Spacecraft Poised to Enter Orbit at Vesta Asteroid: Scientific American.